StogieGuys.com will be taking tomorrow off to enjoy that most American of holidays: Thanksgiving. (We will return Friday for your regularly scheduled Friday Sampler.) Known for an abundance of great food, Thanksgiving is a perfect time to enjoy cigars with gathered friends and family. As we did last year, today we’re listing the one cigar we’ll each be firing up after the big meal. Patrick A: Call my pick corny or contrived, but this year I’m picking the CAO America Monument. Other than the obvious patriotic connection to our nation’s greatest holiday, this torpedo-shaped behemoth packs enough coffee, pepper, and spice to help me make room for coffee and pumpkin pie. I just hope I can stay warm long enough to enjoy this twice-wrapped cigar’s fine physical properties and well-balanced smoothness. Patrick S: While not quite a U.S.-made cigar like last year’s selection, I’m still going for a stick with a significant American pedigree: the PG Gourmet 15th Anniversary Blend Belicoso Extra. The last time I had one on a full stomach following an good meal it served me very well. Tomorrow, this balanced yet full-flavored masterpiece will be paired with a some fine American small-batch bourbon for a fantastic post-turkey pairing. George E: I’m planning to light up a powerhouse puro that will easily cut through the afterglow of any large meal and leave its own lovely memories. The Serie 601 “Red” from EO Brands, reviewed nearly two years ago, continues to satisfy with complex, smoothly blended flavors and Nicaraguan strength that pleases rather than overwhelms. Whether your after-dinner routine revolves around a cup of coffee and quiet contemplation or friends and football, this cigar will enhance any experience. 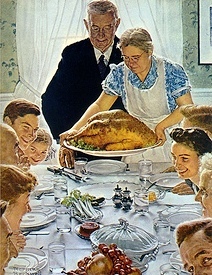 All the best from the StogieGuys.com family to you and yours for a happy, cigar-filled Thanksgiving! I'll be smoking a Famous Nic 3000 Double Robusto and a Camacho Coyolar Diploma. We celebrated Sunday with my wife's parents because they'll be out of town on Thursday visiting another of their kids' family. We had a great dinner after which I was able to light up a special occasion cigar that was given to me at the Big Smoke earlier this month: Fuente Fuente Opus X Lancero. Whole lotta punch in that skinny thing! For actual Turkey Day, I'm still trying to figure out what I'll smoke, but if I'm feeling especially festive, I might break out another Big Smoke stogie: Padron 1926 40th Anniversary. Gentlemen and all readers – have a safe and fun Thanksgiving. As a former Marine who has smoked many a cigar away from home on too many holidays, here is to all those that have fallen and to those that walk the line – God bless and thank you. I will be firing up an El Tiante Corojo Belicoso. That full bodied smoke should go well with my full stomach! I’ll be smoking a Don Kiki Brown Label from Cuban Crafters. Sounds like some enjoyable leaves will be going up in flames. Happy Thanksgiving everyone. I will be enjoying a Montecristo Platinum Series. I usually smoke a No.2 or a La Fleur Dominicana Legaro. I don’t know quite what it is about the Platinum Series, but I enjoy the hell out of that smoke. Happy Thanksgiving! This year I'm most thankful for… my wife not finding out how much I actually spend on cigars (especially last night in preparation for Thanksgiving)? But hey, turkey day calls for something special. I'm trying to decide if my post Thanksgiving smoke will be a Padron 1926 #1 maduro, Padron 1926 80 year maduro, Padron 1926 45 year natural, or a La Flor Dominicana El Museo.